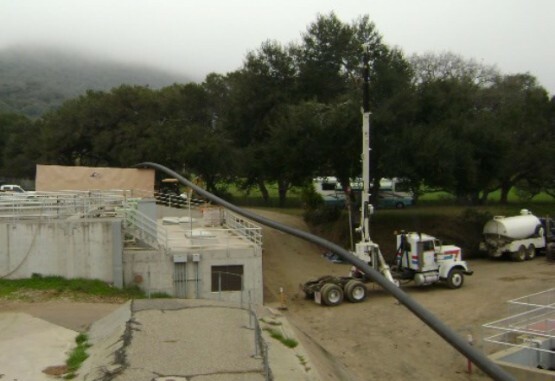 Bennett Trenchless was the prime consultant to the City of Solvang for preliminary design of the 16-inch diameter, 1,400-foot horizontal directional drilled crossing of the Santa Ynez River. The existing force main had been originally installed in the river bed using open-cut methods. Scour had exposed the pipeline and threatened its survival. A new force main had to be installed parallel to the existing force main, connecting the wastewater treatment plant on the south side of the river, to the pump station on the north side of the river. Preliminary design included review of existing geotechnical information, execution of a supplemental geotechnical investigation, acquisition of environmental permits, calculating pullback loads and pipe stresses, evaluation of hydrofracture and settlement risks, and design of the crossing itself. Bennett Trenchless teamed with the HDD Company, Inc in a design-build contract to finalize design and construct the pipeline. Horizontal directional drilling was used to install 1,400-feet of 16-inch DR 11 HDPE pipe at a maximum depth of 80 feet below the river bed. Tie-ins on either side of the crossing were designed by Penfield & Smith and constructed by Hanly Construction. Bennett Trenchless provided full-time on-site construction inspection for the horizontal directional drilling portions, as well as the testing and contact grouting. The project was completed within budget and schedule with no claims.